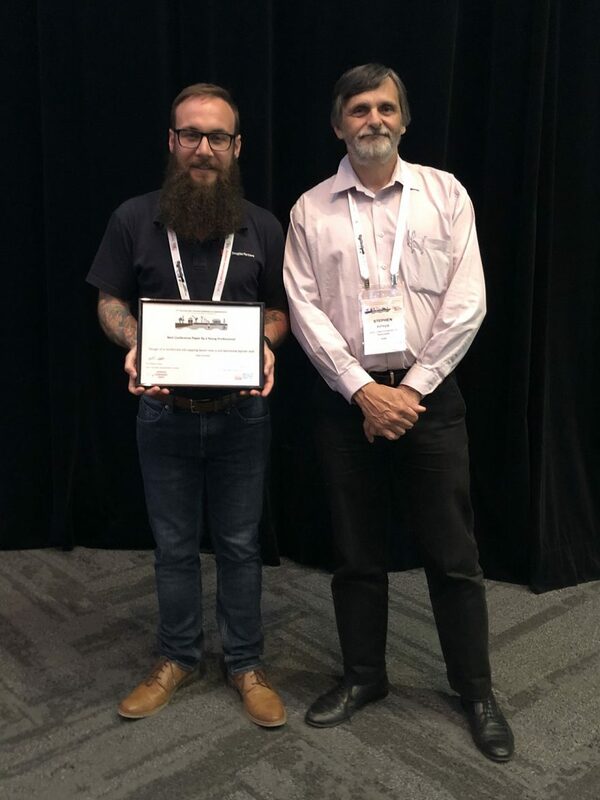 Sean Goodall, Geotechnical Engineer based at Douglas Partners' Newcastle office, has taken out the award for the Best Conference Paper by a Young Professional at the 13th Australian New Zealand Conference on Geomechanics. Sean's award was presented by the National AGS chair, Professor Steve Fityus at the completion of the conference which was held in Perth in April 2019. Sean presented an innovative approach recommended by Douglas Partners to reduce project costs associated with a soil-bentonite wall that will be used as part of the remediation strategy for a former gasworks. In Sean’s paper titled “Design of a Reinforced Soil Capping Beam over a Soil-Bentonite Barrier Wall”, it was recognised that adding cement to the soil-bentonite mixture to improve the trafficability over the wall was costly and could have had a detrimental effect on the permeability of the wall. Sean’s paper presented an alternative solution and the methods used to design a reinforced soil capping beam over the soil-bentonite wall. Sean's award was presented by the National AGS Chair, Professor Steve Fityus.